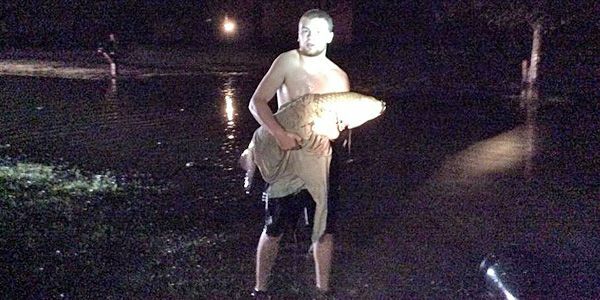 This guy caught a 3 foot carp swimming in his street because it was so flooded. After catching the fish he decided to put it in the pond instead of leaving it trapped in the streets or in the putting it in a pool. The fish could have died in the pool because the water has chlorine in it and fish aren't meant to swim in chlorine. The chemicals in chlorine cause fish to grow weak and eventually die. The pool water is different from the pond water. The pond has oxygen from plants the fish needs. So it was a much better idea that Jake put that carp in a pond. Jack Sawyer, age sixteen, caught a three foot carp in northern Ohio during a flood. He said the rain had been as high as his mailbox and that the carp probably came from a nearby pond. He also said he caught the approximately forty pound fish by coming close to it and grabbing it so he could bring it back to the pond. Jack Sawyer didn't want the fish to become trapped and die in the street and he also couldn't keep it in any way so he put it back in the pond. I think that it was very cool for Jack Sawyer to put the fish back to save its life. If it were me I wouldn't touch the fish at all let alone carry the forty pound carp all the way to a pond. 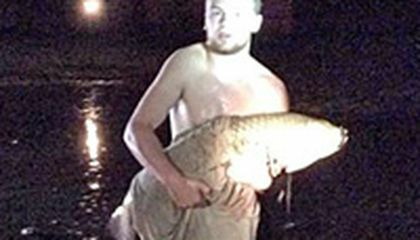 Jake Sawyer, a northern Ohio teenager, caught a 3-foot carp on his street, in which there was flash-flooding from heavy rains. He waded through the more than ankle-deep waters on Monday night and eventually trapped the big fish. He scooped it up with his arms after testing other methods, and his mother caught it all on tape. Sawyer returned the fish, which he estimated to be 40 pounds, to a nearby pond. I think that this story is a little strange because this huge fish slips out of the overflowing pond and is swimming along in the flooded streets. However, it is cool that Sawyer caught it and returned it to its rightful place. This article is about how a 16 year old boy caught a giant fish barehanded. Since there was a big storm that night there was a flash flood and he suspects that it came from a nearby pond. His first idea in catching it was to throw a towel over it to make it stop moving. When that was a failure he decided to just grab it. When he finally got it he moved it into a nearby pond and said it weighed an estimated 40 pounds. I think that this would've been an awesome experience to have. I also think that it was nice of him to put it back in a pond. Jake did a good thing for the fish. He probably knew that if the fish didn't get back to its natural environment, it would probably die. But, I don't imagine it was easy for him to catch the fish and to carry it the whole way back to the pond where it lived. I think it's awesome that he was able to catch the fish barehanded. His way of catching it and making it comfortable with him was a very smart, and unique method. It was kind of him to think of the fish and return it to safety instead of letting it go to die. I would have never been able to do what he did in terms of saving the fish. This article is about how a 16 year old boy named Jake Sawyer caught a very large fish barehanded. There was a big storm that night and he suspects that the fish came from a nearby pond. His first idea to try to catch it was to throw a towel over it to make it stop moving. When that was a failure he decided to just grab it. When he finally caught it he moved it into a nearby pond. He claimed it weighed an estimated 40 pounds. I think that this would've been a great experience to have. I also think that it was nice of him to put it back in a pond. Not every day you see a 40 pound fish swimming on your street. If I saw a big fish I would just leave it there. it was nice of the kid to bring it to the pond. It was also smart not to put it in his pool or else it would have died from the chemicals from the pool. I'm also surprised that he was patient enough to trap it instead of just trying to pick it up. I think it was really cool that he caught that huge fish bare handed. I don't think I would ever have the bravery to do that. I also thought that it was really nice that he released the fish right after he caught it so it doesn't die. Most people probably would have killed it.